Ahh the summer sun, how beautiful it is and what better way to enjoy it than with a fresh and colourful simple summer salad. The juicy tomatoes bursting with so much flavour is heavenly, plus it is also a great source of healthy antioxidants and vitamins, which is great especially if you are like me and do not take vitamins (even though I know I should) or forget to take them. 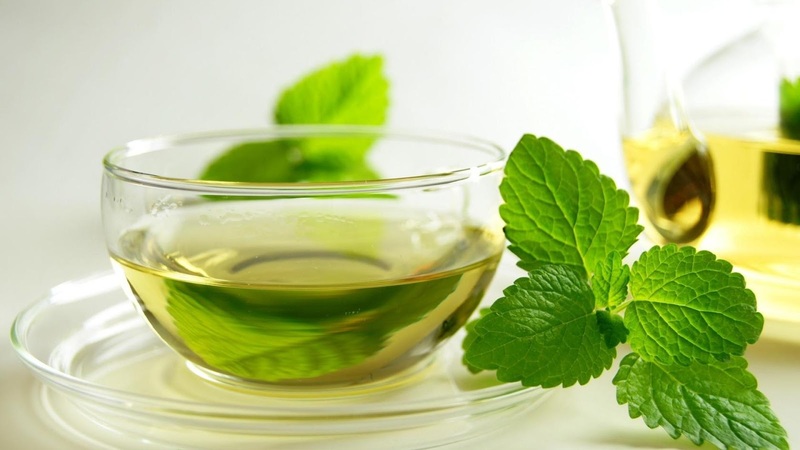 Mint is great for the digestion, its beautiful strong smell is brilliant, especially if you have a headache it can help clear the head and it is also great as a tea as it can help settle your stomach. I've used two great oils, olive oil which is a great source of Monounsaturated fats and which is really good for the skin and can help maintain cholesterol and rapeseed oil, which has the lowest saturated fats of any oil. So that said, here is my recipe for this super quick tomato and mint salad. I hope you love it. 1. 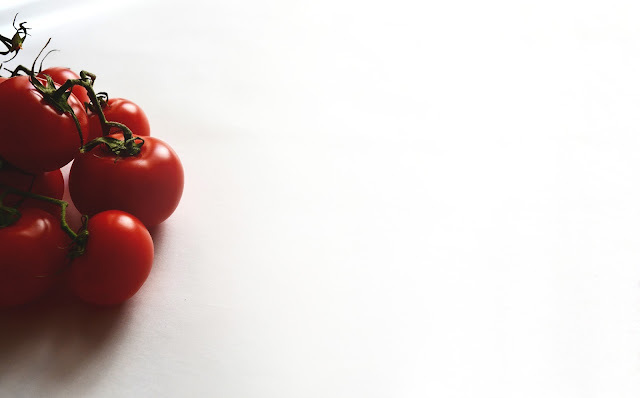 Start by halving your tomatoes into place to one side (obviously making sure before you start, all your ingredients are washed) in your mixing bowl. 2. Roughly chop your mint and sprinkle over your cherry tomatoes. 3. Now drizzle your olive and rapeseed oil over your tomatoes. What I like about this salad is, that it is super easy and fresh, plus it is a great dish to have one it's own with a nice glass of chilled wine or if at work great to have at your desk or even as a side dish. I promise. Just what I need in this impressive British summertime heat. How are you cooling down this summer? Do you have any great dishes that you are making without turning on the oven? I would also love, love, love if you follow me on Bloglovin for all the latest posts and blogs and if you don't have time to go through it now you can always save it to read later, plus you can also like my Facebook Page here. I am definitely, definitely making this salad this weekend! 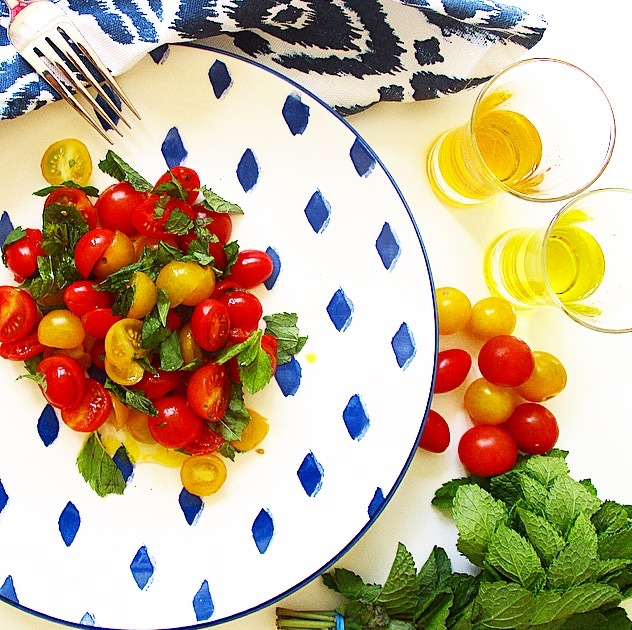 I love mint and I love cherry tomatoes but never thought to pair them together! I always come to your blog for healthy recipe inspiration and you never let me down! Great recipe and your photos are so beautiful! Cat, it is so good and so fresh, perfect as a main or as a side dish. Surprisingly Leanora loves it too, not so much the mint but she always pinches my tomatoes lol! So great for all the family and super quick to make. I found your blog and now I see that my lovely friend Cat is a fan - I know why I like it! Hey, so glad you found and like my blog. Oh if your looking for something new and meat free, you may like this Aubergine Lasagne so good and tasty, we try to eat no meat at least 3-4 times a week.